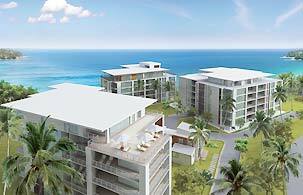 Karon Hill, a luxury condominium project nestled in the hills surrounding Karon Bay on Phuket's sunset coast. Just 5 minutes from the entertainment, nightlife and the beaches of Karon, Kata and Kata Noi, approximately 40 minutes drive from Phuket International Airport. There are 3 types; one bedroom, two bedrooms and three bedroom Penthouses. The size of each apartment ranges from 96sqm, for one bedroom up to 162sqm for 2 bedroom units and 360sqm for three bedroom penthouses. The building contains seven floors, the top floor features 3 penthouses each with over 300sqm of space. Karon Hill accentuates in the top quality construction and decoration materials that are carefully selected to ensure the high quality finishing and give the project tasteful design and style. Structure: Pre-stress Concrete Piling, reinforced concrete column/beam and floor. Roofs: Concrete Slab with waterproof system. Corridor/ walkway: ceramic tile, 24x24 in. Walls: Plastered masonry walls with wall paper finish. Ceilings: Kitchen/Bathrooms; gypsum plaster (moisture proof type) with paint. Dinging/Living/Bedrooms: Gypsum plaster with paint. Terrace; fibre cement strip with paint. Doors/Windows: Exterior; powder coated aluminium with tinted 6 mm. glass and import fittings. Entrance; wooden Door with Hafale’s fittings. Sanitary ware: COTTO or equivalent. Bathtub with equipments of COTTO or equivalent. Appliances: Concealed electric water heater, Siemens or equivalent. Individual controlled concealed air conditioning units in bedroom and living room. 2 telephone sockets – one for direct line in bed room and one for internal line in living room. Cable ready for local TV. Built-in furniture: Built-in Wardrobes; timber frame with hardwood veneer panel. High quality kitchen wood cabinet with imported fittings and granite counter top or equivalent.